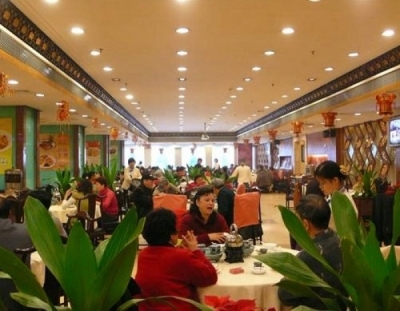 Though you might not know the name, or be able to pronounce it, Hongxingyidu is one of Guangzhou's most well-known restaurants and is featured in nearly every guide to the city. It's long riverside corridor, busy and overflowing at night, is practically a local sight in itself. Just five minutes on foot from Haizhu square and next to one of the riverside piers, Hongxingyidu offers every kind of seafood and a wide selection of Cantonese cuisine. You can even pick your own seafood from the restaurant's indoor tanks, which are large enough to fill up much of the first floor and could probably function as a city aquarium. You'll have difficulty eating on a budget here, but you can find some 20-30 RMB dishes if you have a sharp eye. Pricier offerings run into the hundreds. Best time to get a seat: For dinner, either make a reservation, or get there before 6:30 pm. Getting there: Take bus 1, 183 or 544 to Nanguan bus stop. Walk towards the river, turn right, and ten minutes more should find the restaurant on your right Or Metro Line 2, Haizhu Square Station.Exit A. Walk twenty yards to the road by the Pearl River and turn left. About three minutes walking will take you to the restaurant on your left.